Colloidal Silver has been used since the late 1800’s in countless applications, and encompasses a wide variety of silver products. Many contain (claimed or unclaimed) salts, proteins, compounds or stabilizers – all of which affect the safety and efficacy of silver. 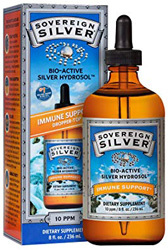 Bio-Active Silver Hydrosol by Sovereign Silver, represents the ultimate refinement of the colloidal silver category. It contains 98% positively charged silver, in pharmaceutical-grade purified water. Our unique silver species, with a verified and unmatched particle size, remains in its most active state for use within the body. If silver is not positively charged, it doesn’t work well. At best, most collodial silver products contain only 10% charges silver. Sovereign Silver contains 98% positively charged silver [Ag(n)1+], making it exponentially more powerful than other brands. The smaller the particle size, the easier it is for the body to absorb and eliminate. Sovereign Silver features an unprecedented particle size as small as 0.8 nanometers, verified by 3rd party. No other silver can prove the same. When it comes to concentration, more is not always better. Our tiny particle size yields greater surface area and higher efficiency, making our 10 ppm (parts per million) product more effective than competing brands containing up to 500 ppm. Taken 7 times a day for 70 years, Sovereign Silver still falls below the EPA’s (Enviormental Protection Angency) daily oral Reference Dose (RfD) for silver. Maintenance Dose – Once daily, hold 1 tsp. under tongue for 30 seconds before swallowing. Immune-Building – 3 times daily. Long-Term Immune Support – 5 times daily. Short-Term Immune Support – 7 times daily.